Stately historic building that has origins dating back to 1200, belonged to the aristocratic "Gessi" family and decorated by masters of the Renaissance Hotel Palace is now a comfortable three-star that shines in the city center. 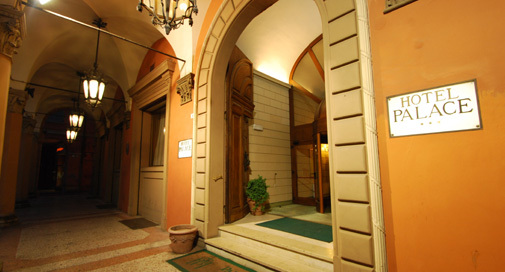 A few steps from Piazza Maggiore and the majestic Fountain of Neptune, the hotel is an ideal starting point to visit the monuments of the city center and shopping streets sparkling under the famous arcades, as well as museums, exhibition halls and theaters (download the map PDF here). The centrality of the hotel offers a wide range of dining options: typical restaurants, ethnic restaurants, pubs, pizzerias and fast food, all within walking distance!